As avid travelers, we understand that the right gear can make or break your trip. Therefore, it is our passion to create travel accessories that excel in design, quality and performance. We are a small family-run business and are devoted to making each and every customer a raving fan. If there is anything we can do for you, just send us a message - we'd love to hear from you! We believe that traveling is one of the most enriching things you can do. To help you on your next journey, we have created a FREE EBOOK that you will get as a gift with your money belt. It contains tons of tips and tricks to protect yourself against tourist scams and pickpockets. This eBook was written exclusively for D&D Wanderlust, you will not find this eBook anywhere else. When designing this money belt, it was our goal to create one that is comfortable, durable, practical and stylish. The moisture-wicking back and ultra-soft elastic straps make it feel like silk against your skin, and our innovative duo-belt ensures the perfect fit, whether you are rocking six-pack abs or voluptuous curves. This belt consists of two parts, that can be used separately or combined, for any waist size between 24" -57" inches. The two pockets close with premium YKK zippers (the world's top brand). The large pocket contains a mesh inner structure and carabiner hook to keep your passport, money, keys and cards organized and securely in place. The whole pouch is lined with the highest grade of RFID blocking fabric to protect you against digital theft, and the waterproof nylon exterior to keep your valuables safe and dry. WORRY-FREE TRAVEL: Give yourself the ultimate peace of mind, so you can travel the world with confidence. Rest assured that your valuables are hidden safely under your clothes and out of reach of pickpockets. Even digitals thieves don't stand a change as our money belts are lined with special 100% RFID BLOCKING fabric. Say yes to adventure and get ready to explore the world! 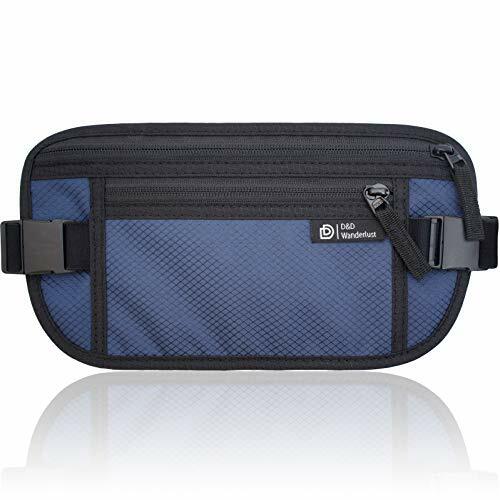 TRAVEL IN STYLE: Look your best with this stylish money belt! This flat waist pouch won't add those 'extra pounds' around your waist like bulkier designs do, and our fashionable designs are the perfect accessory to any outfit. Don't settle for a dowdy money belt, but get ours today and get ready to TRAVEL THE WORLD IN STYLE. FITS LIKE A GLOVE: You won't even know you're wearing it! The moisture-wicking back is as soft as a feather and will keep you cool even in warmer climates. Our slim money belt for men and women is designed with a slight curve that follows the lines of your body to secure an optimal fit. This travel belt comes with an innovate two-piece adjustable elastic belt makes it the only on the market that can fits waists of 24"-57" inches. BECAUSE YOU DESERVE THE BEST: As avid travelers ourselves, we understand that you need travel gear you can depend upon, especially when you have left the safety of home to explore the world. At D&D quality is a top priority and all our money belts are designed with care and build to last. We only use the best materials available, including PREMIUM YKK ZIPPERS, ultra-soft elastic straps and top-quality waterproof nylon. LIFETIME GUARANTEE: We truly care about our customers and we are confident that you will love our money belts. Therefore, we offer a hassle-free lifetime guarantee on all our products. If you are not 100% satisfied with any aspect of our product, we will refund the full purchase price - no questions asked. If you have any questions about this product by D&D Products, contact us by completing and submitting the form below. If you are looking for a specif part number, please include it with your message.